Updated 4.23.2011 Click on pictures to see larger images. "Barry Witcomb is still making frames at the original premises - 25 Tanners Hill, Deptford, London, SE8 4PJ (tel: 44 0208 692 1734). Deptford is a (south east) suburb of London near Greenwich (home of the CuttySark.)" Update July 2009: The Tanners Hill location has now closed. 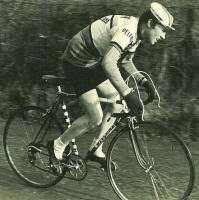 Geoff Carter in action in a hilly time trial near Nottingham, England. Bike is model L'avenir no. 520166 built in November 1966, colour red with black and white contrasts bands. It was purpose built to specification with thick seat stays, the vogue of the time. It has Campag Gran Sport steel hubs with Fiamme sprints, Gran sport front and rear changers with bar controls, Mafac Racer brakes and a Stronglight/TA chainset. "I still ride the bike on a regular basis and had it resprayed for its 30th birthday." Fred Rednor's early 1970s Witcomb..